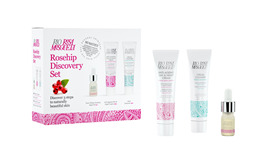 Discover Rio Rosa Mosqueta`s best-selling skincare products in mini sizes. Just 3 simple steps to naturally beautiful skin. Cream Cleanser cleanses skin without drying, Pure Chilean Rosehip Seed Oil repairs the skin and Anti-Ageing Day & Night Cream deeply moisturises. These delightful small sizes are ideal for trial, travel or as a gift. Try it. Love it. 100% natural skincare products. All Rio Rosa Mosqueta products are formulated with Pure Chilean Rosehip Seed Oil to nourish and restore the skin naturally. Aqua (Water), Helianthus Annuus (Sunflower) Seed Oil, Butyrospermum Parkii (Shea) Butter*, Cetearyl Alcohol (from coconut), Glyceryl Stearate, Octyldodecanol, Persea Gratissima (Avocado) Oil, Glycerin, Orbignya Oleifera (Babassu) Seed Oil, Sodium Stearoyl Glutamate, Rosa Rubiginosa (Rosa Mosqueta) Seed Oil*, Aloe Barbadensis (Aloe Vera) Leaf Juice*, Chamomilla Recutita (Chamomile) Flower Extract, Persea Gratissima (Avocado) Fruit Extract, Caprylyl Glycol, Equisetum Arvense (Horsetail) Extract, Xanthan Gum, Tocopherol, Tocopheryl Acetate, P-Anisic Acid, Lactic Acid, Sodium Lactate. Rosa Rubiginosa (Rosa Mosqueta) Rose Hip Seed Oil, Tocopherol (Vitamin E). Aqua (Water), Glycerin, Butyrospermum Parkii (Shea) Butter(, Rosa Rubiginosa (Rosa Mosqueta) Seed Oil*, Cetearyl Alcohol, Cocos Nucifera (Coconut) Oil*, Octyldodecanol, Glyceryl Stearate, Macadamia Ternifolia (Macadamia) Seed Oil*, Sodium Stearoyl Glutamate, Aloe Barbadensis (Aloe Vera) Leaf Juice*, Porphyra Umbilicalus (Red Alga) Extract, Rosa Centifolia (Provence Rose) Flower Extract*, Camellia Sinensis (White Tea) Leaf Extract*, Calendula Officinalis (Calendula) Flower Extract*, Helianthus Annuus (Sunflower) Seed Oil*, Caprylyl Glycol, P-Anisic Acid, Xanthan Gum, Lactic Acid, Tocopherol,Tocopheryl Acetate, Sodium Lactate. Gently massage into damp skin, then rinse with warm water and a warm cloth. Or remove with cotton wool. Gently massage with your fingertips for 2-3 minutes to penetrate the deeper layers of the epidermis. Apply morning and/or evening to cleansed skin. 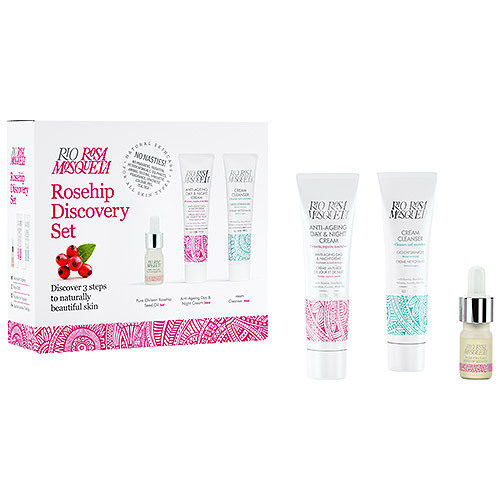 Below are reviews of Rio Rosa Mosqueta Rosehip Facial Discovery Set by bodykind customers. If you have tried this product we'd love to hear what you think so please leave a review.